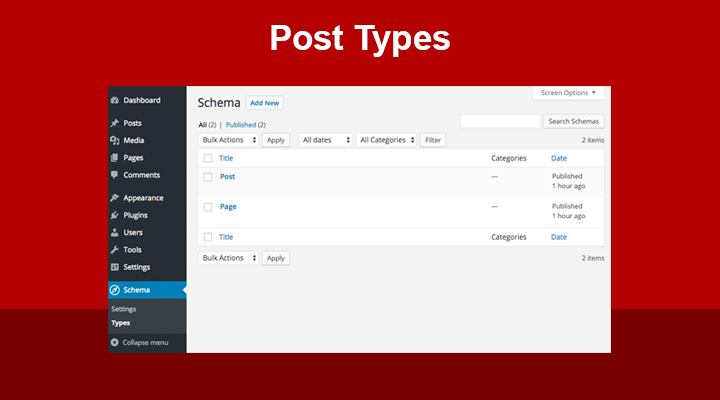 By default, and once you install the Schema plugin on your WordPress site, it will create two entries for “Post” and “Page” post types under the Schema > Types section. Schema Types section is a special custom post type that is used to create and save schema.org types to be used by the Schema plugin to markup your choice of site content. This unique feature will allow you to enable schema.org types per post type. You can edit each schema.org type to modify it per your liking. Once you save your modifications, the Schema plugin will start processing it through your content to output a valid schema.org markup in JSON-LD format. For example, if you have WordPress site with two post types for documentation and news. This means your will be able to create a new schema type for each section and enable it to work on these post types (documentation, news), this is how simple it is. Want support for more schema.org types? Check out Schema Premium, it has support for more schema.org types that you can use to markup your website content.